is definitely a first for me…my first ever Halloween mantel. items in combination with those I already had on hand. I ended up spending less than $10.00. disappointment as to them, the Halloween mantel was ‘way cooler’. Well there you have it, my first ever Halloween mantel…how did I do? any Halloween related projects to inspire and be inspired. I can’t wait to see what you all come up with. 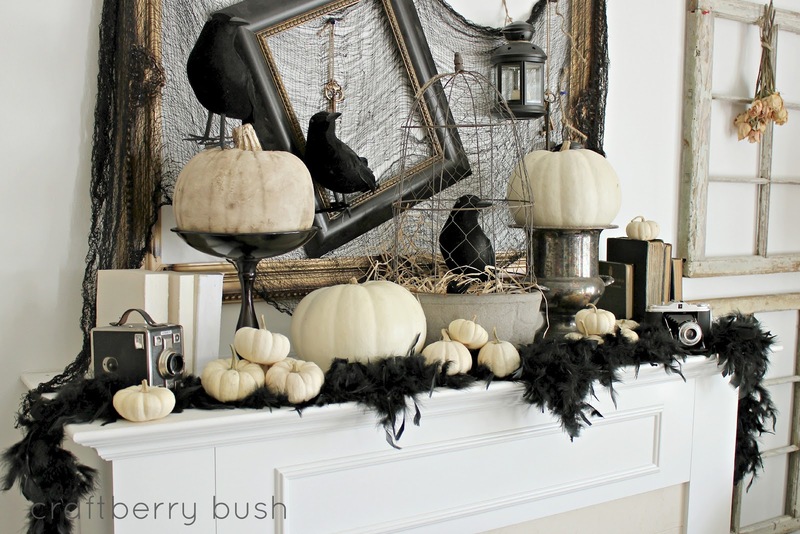 Your Halloween mantel is just gorgeous! It’s classy, but fun and I love how you stuck to a neutral color scheme. One day, when I have a real mantel, I am copying that verbatim, Lucy. Wow. That is magazine worthy. The addition of the old school cameras add so much character. We are really excited about this party! It’s going to be a fun month. Your mantle looks awesome! I love how you turned the planter into a bird cage. I have something similar to that. Thanks for the inspiration! you’re ridiculous. i’m gonna pretend i didn’t read this is your first halloween mantel, b/c it puts a lot of us to shame! Oooohh, I love it! Looks like a mantle right out of a page of the Pottery Barn magazine =) I will have to link mine up tomorrow. 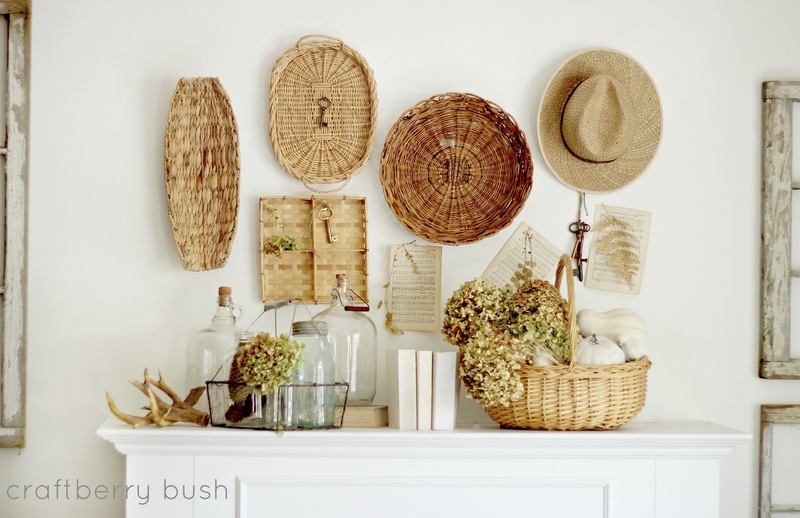 your eye for styling a mantel is beyond fantastic! I love this and cannot believe you took it down;)!! and I wish my dollar store had those crows. maybe i should check again to be sure. seriously, fabulous! Hi Lucy, I’m joining in the link party today with a visit to a friend’s wonderful home decorated for Halloween, she has so many fun ideas for Halloween decor. thanks so much for hosting! LOVE the mantel! I love that the dollar store carries crows since they can cost 7-14 bucks at Michaels, depending on the size. Great job! I am also putting together my first Halloween mantle this year… We’ll see how it turns out! LOVE the mantel! It’s amazing! Beautiful, as always Lucy! Thank you so much for the Halloween Party! Your first – but I’m sure not your last – what a fun mantel!! I need to post mine but in the meantime I shared a couple of others – thanks! Love your mantle Lucy. The dollar store is my go to place for Halloween decor too. Love the mantle too! What a fun idea this is! Seriously, that’s your first Halloween mantle?? Wow and too cool and wow again! So wait!! Did you say you already took it down??? Why? I love it, It’s so haunted house..ish! I’ll be linking my mantel once I get around to blogging about it, excited for your party. Cute! & I love that old camera!!!! seriously beautiful sweet friend. I love the inspiration even though I am like you in the fact that I would rather have fall decor vs halloween. :o) still so beautiful! Love your mantel! Absolutely too cool! I’d like to invite you to share it at my party, Twirl & Take a Bow at http://www.houseontheway.com. It would be a perfect addition! Hope you can stop by! I love your mantel! I did ravens and vintage silver on my kitchen mantel too! Thanks for hosting such a fun party! 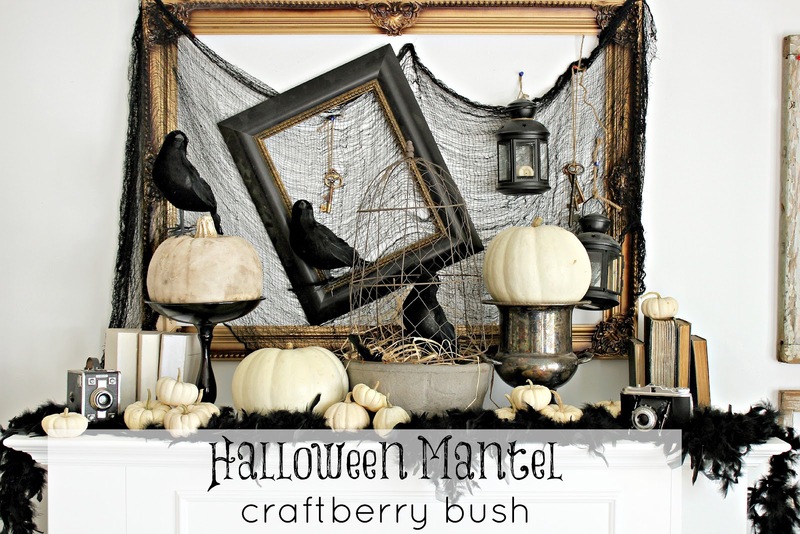 Gushing over the mantel – so spooky good! 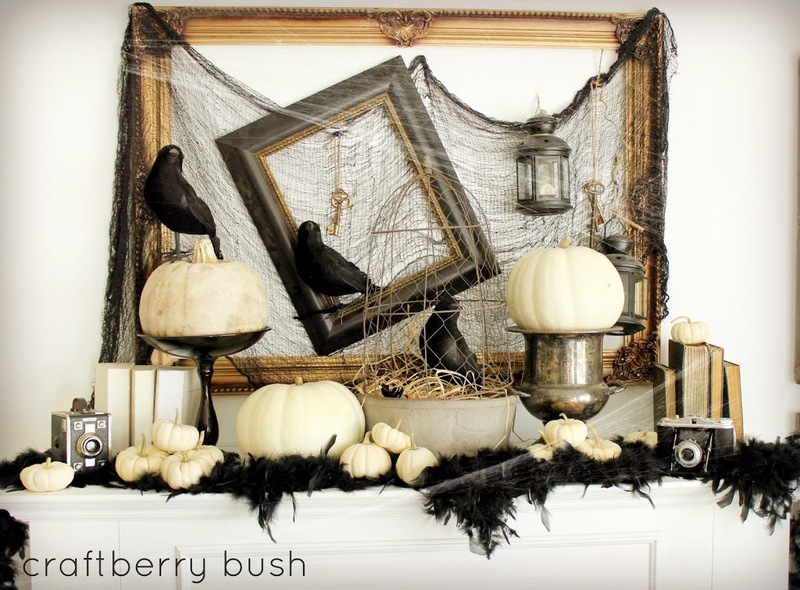 What a gorgeous Halloween display – sophisticated and spooky! Holy smokes you are good! I am not that into to Halloween but I would die for this in my house. It is fun and yet classy, great job Lucy! I love your mantel it is fabulous, the empty frames and draped fabric is just the right touch. Great Job. I decided to go Black and White throughout my house this Halloween. I can’t wait to wrap up my decorating and post some pictures. I will be joining your Linky party soon. Fantastic fall inspiration! Thank you for hosting! You are so stinking cute! Just saying. And your mantel…it is amazing! YOu are a killer! Can you send that gorgeous mantle to my house since you’re done with it already?! Fantastic! You never cease to amaze m. Great job! Great mantel! I love your eye for display!I hope you don’t mind,I featured it on my blog. 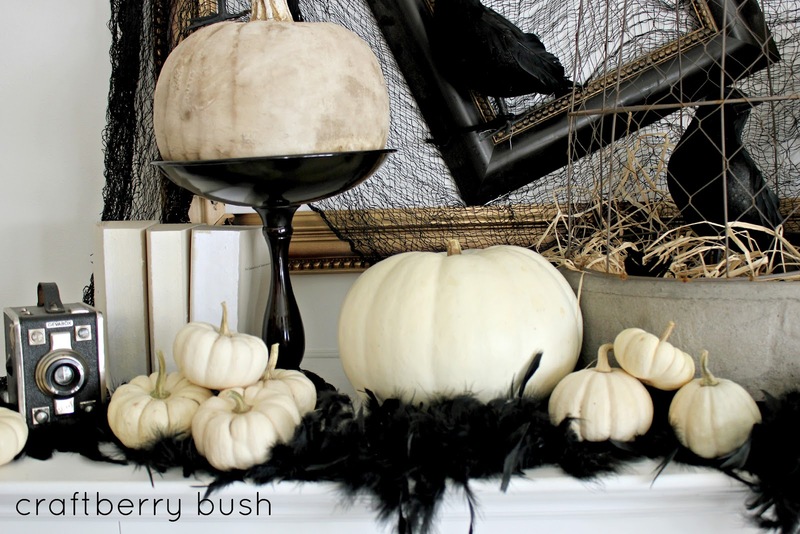 Such a fun Halloween mantel! 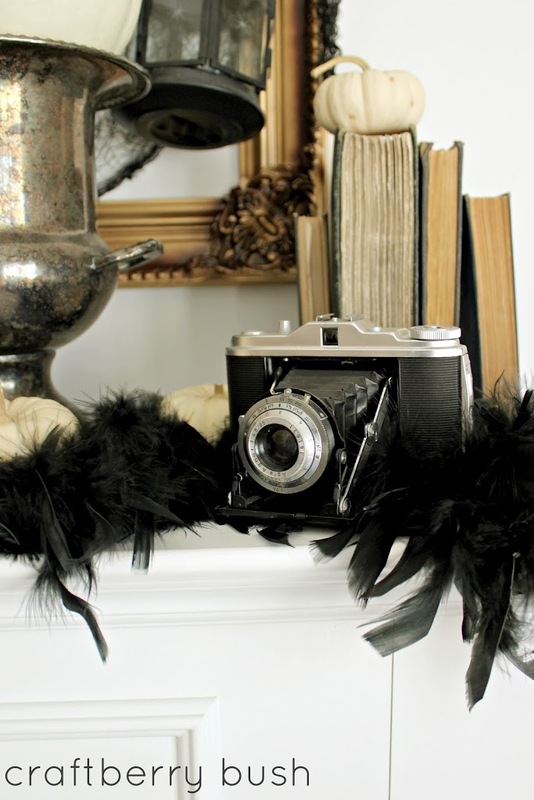 I love how you incorporated your vintage cameras into the vignette, too. 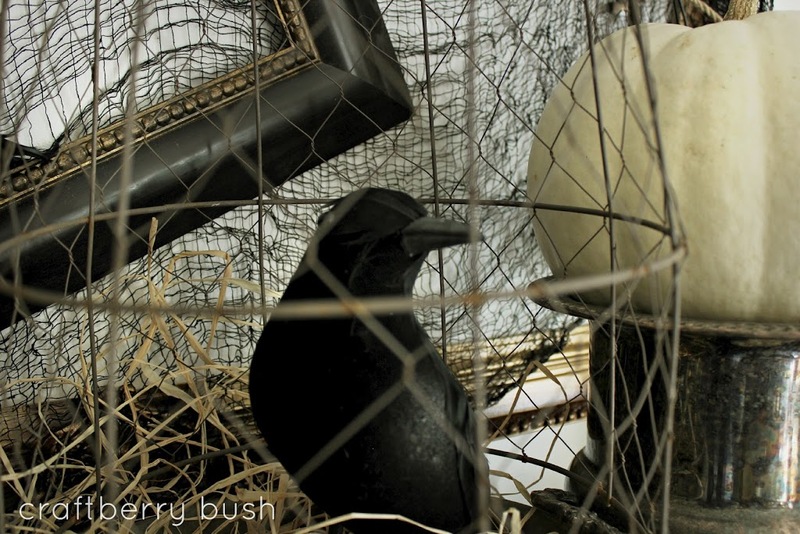 Hi Lucy, I linked up my Halloween vignette. Thanks so much or hosting. Love your mantel! 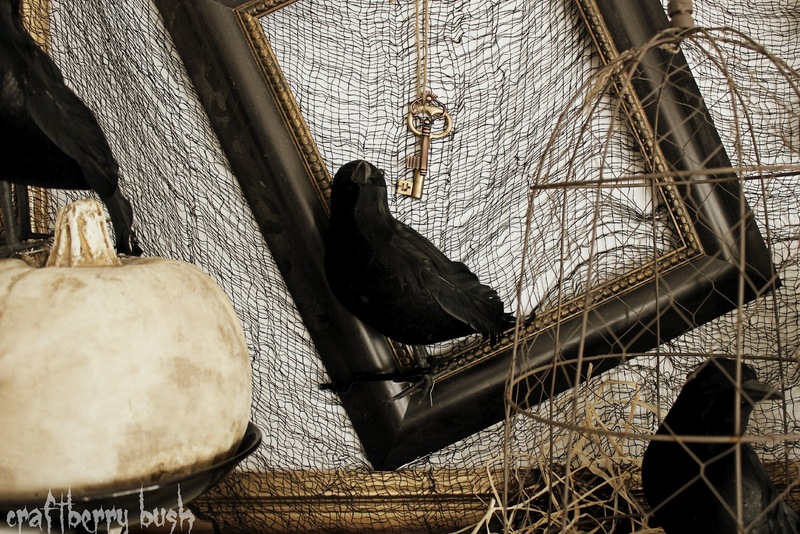 The crooked frame with the crow sitting in the corner is so clever. Such a fun idea! Your presentation is so elegant and whimsical yet spooky and mysterious! How you achieved that combination outcome is beyond me. Actually, I know: creativity and imagination. Love your unique design! You did an amazing job, as always Lucy! I featured you again today in my Friday I’m In Love favorites. That is an amazing mantel. It would be my inspiration if I did Halloween decorating.